For decades Yolngu of north-east Arnhem Land have proven their commitment to the the sustainability of life in homelands. Yolngu living on their own country are healthier, happier, have high levels of school attendance and are earning real income from a variety of activities. 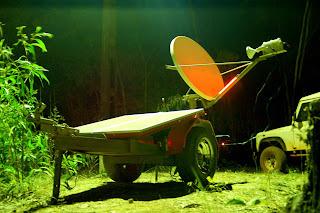 Although Yolngu living in homelands own significantly more personal computers than Yolngu residents living in towns, homeland residents often have poor internet access. The INC (Inter Networking Communities) research project at CDU (Charles Darwin University)together with homeland residents identified some major reasons for the poor and often non-functional internet connections, included unstable. unreliable and intermittent power supply, as well as a lack of societal commitment to supplying infrastructure to outlying communities. The 'e-gipsi' (extra-geo internet provider with solar infrastructure) is a tool which is being developed as a way to suggest ways around these issues. By making a mobile all weather version of a solar powered satellite wireless internet provider, we would not only have an object that would be able to test various components for their robustness and durability in harsh climatic conditions, but then test them in different locations and be of use in promoting the issues we had encountered in remote areas at events such as the Garma festival and the Sydney biennale. theweathergroup_U is a collective interested in pursuing experimental methods of audiovisual media production, environmental mapping and monitoring technologies, and processes of community-based interaction and knowledge exchange. As artists and media workers, they are primarily concerned with cross-cultural digital storytelling methods. interactions with natural systems that punctuate our daily existence. At the biennale of Sydney 2008, theweathergroup_U is collaborating with CDU through one of their members, artist and researcher Bryce Anbins-King, to display a version of the e-gipsi which is designed to provide internet access to a local area network anywhere in Australia, and to use this connection to provide live on-line content to the exhibit. While this this version of the e-gipsi has it's practical limitations, it is a functional object which is designed to exemplify some of the issues involved with the use of digital technologies in the processes of community information exchange. In order to operate on Cockatoo island for three months over winter, a wind turbine was introduced to supplement the power production of the solar panels, and We are currently experimenting with the use of remote access software over satellite connection with the hope of providing access to computers being operated at events in Arnhem land to visitors to theweathergroup_U exhibition space on the island.